In the last three weeks I have been to 9 doctor's appointments and one ER visit. I came down on the dosage of my prednisone from 12.5mg to 12mg and this small adjustment has led to an RA flare. It has affected my vision, caused bleeding from the bladder, and made it difficult to walk. Unfortunately my vision has taken a hit from my Rheumatoid Arthritis - both figuratively and literally. I have been having headaches, dizziness, difficulty focusing, and vision loss. I have inflammation in my eyes due to an RA flare. It turns out I have ciliary spasm and uveitis which is the leading cause of blindness. At this point the doctor is hopeful with treatment we can manage the symptoms and keep it under control. I have to admit it's a little scary. Most days I fight and feel like I'm winning. Other days are a little tougher. Good news is inflammation is starting to go down. Still working on Meiobian Gland dysfunction. The doctor had to put me in multifocal lenses. To fix my distance it compromises my vision up close so we had to accommodate for both. And there is some permanent loss. Vision went from -6.5 to -7.5 in right eye and -8.0 in left eye. 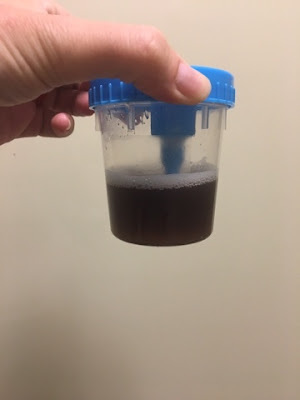 This is what my urine sample looked like and what had the doctor send me to the ER. I am on a constant regiment of antibiotics due to my compromised immune system and persistent UTI's caused from RA. After several hours, blood work, urinalysis, and CT scan, they sent me home with yet another antibiotic and antispasmodic. At my follow up with my urologist, we decided to discontinue my constant source of antibiotics and treat it reactively rather than proactively to save my stomach a bit. This is the procedure used for transplant patients and patients with a compromised immune system. At the first sign of infection we will treat with a Rocephin series. He feels like the blood in my urine is due to inflammation from the RA flare. My activity has been limited from this flare. I am exhausted, but I can usually push myself thru it. In a major flare it is a little tougher. I am dealing with more pain. And both my ankles/Achille's Tendons, knees, and hips are making it difficult to even walk. I'm doing what I can, but it's not been much. Typically when I have a flare we increase steroids to get me thru it. But I am working so hard to lower my dosage. So I am just trying to tough it out. I am wondering if this is the right decision. My rheumatologist talked to me about us having to consider altering our treatment plan, and I am thinking this is where we are going to have to head next. 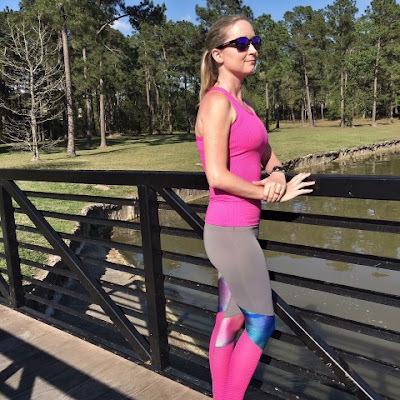 Running and triathlon are not bringing me pain. Exercise is not causing my broken bones or leading to my vision loss. Instead running and triathlon keep me focused on moving my body when I can hardly get out of bed in the morning. Running and triathlon are helping keep my head clear from worry and stress and my heart free from the burden of my disease. Rheumatoid Arthritis is the cause. I can choose to lay down and let it take over or I can continue to live and do what I love. It's not even a choice I have to consider. I have gotten many texts and messages of concern and I know these concerns come from a good place and I really appreciate it. I am resting when I need to and I am listening to my body. And I promise I am putting my health first. Getting thru this flare is my priority. Then I will get back to my training. Swimming has been good, so hopefully I can do more of that. Thank you so much for sharing your journey. Knowing all this really brings home to me what you overcame to become an iron man and it is remarkable. I am sending good thoughts and prayers that the flare calms down soon. This share is motivational and no doubt fighting like this is exactly an iron man work. I seriously pray that the people will not loose hope and fight till the end.